There is a crisis growing with the ever expanding population of unwanted parrots in this nation. Breeding mills are pumping out more parrots than there are homes for them. It is estimated that there are between 40 and 50 million parrots in the U.S. today and this number is increasing by 2 to 5 million per year. The rescues and sanctuary’s are all full and over full. So where do the ones go when the owner no longer wants them, and there is no place to take them? This makes me ill to think of what is happening to those poor Feathered Angels. Educate yourself on proper parrot care and then share that information with everyone you possibly can. Living and caring for parrots properly is not an easy task. So the first step in making a difference is in educating yourself, then you can share with others. I highly encourage everyone to read The Writings of Susan Friedman, Ph.D.
Not everyone has a lot of extra time or money, but truly every little bit can help and make a difference. Rescues are happy to have any help. A few dollars or just some time once a week to help clean cages or interact with the birds. It doesn’t take a lot to make a difference. The Rescues love volunteers and so do the parrots. Make them toys, donate items to make the toys. Donate foods, rescues go through tons of food everyday and they need all the help they can get. Ask you local shelter what kind of supplies they are in need of, it may be something not listed here. No matter what form of help you can offer, I promise your experience there will change your heart forever! Pets 911 either place will be happy to direct you to a local avian rescue. Animal abuse and cruelty is not considered a felony in all states…yet. Write letters to your legislators, it doesn’t take very long and it will let your government know that this is a serious issue and something needs to be done about it. Be polite and include the facts in your letters. Not sure who to write to? Here is a link that will direct you to the lawmakers in your area. Find Your Lawmaker at Born Free U.S.A.
Each and every person possesses skills and strengths that they can use. All it takes is a little applied thinking and some creativity with how you can use the skills you already have to make a difference. Combine that with some passion, and you can do wonders. Here are some things you can do to not only promote Parrot awareness but also help raise some funds to donate to your local shelters. Volunteer to do Parrot education and awareness programs at local schools – teaching children the truth about parrots now, will be key to solving the overpopulation in the future. This is the age of the internet and the world is at our fingertips. Post up information on any venue you possibly can. In your own community you can pass out flyers that tell the truth about parrots. Not sure what to write, no problem…here is a link with a page full of flyers you can print and pass out. Another simple thing we can each do, is to not support pet stores that sell live animals. 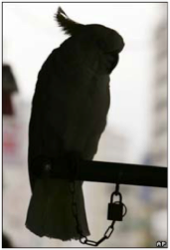 There is no need to purchase products for your parrots in this type of pet store. You can shop online or only purchase from pet supply stores. Don’t put a single dollar in the pockets of stores that sell animals of any kind! These animals more than likely come from breeding mills. Politely share your bird care knowledge with pet store staff and management. Sometimes proper care is just a matter of proper education. Write factual letters of complaint to the pet store’s management and/or corporate headquarters. Threaten to boycott the store until they clean up their act. Encourage your friends to do the same. Report any abuse or substandard conditions to your local animal shelter, humane society, bird adoption/rescue group, law enforcement agency, and/or national animal welfare organization. Here is a link for a check sheet to help you evaluate caregivers and pet shops. INVESTIGATING CAREGIVERS AND PET SHOPS at Born Free U.S.A.
Every one of us has a unique set of qualifications, ambitions, ideas, creativeness, contacts, and resources. Every person makes a difference! Share your love and knowledge about parrots, speak up and let others know about the ever growing parrot population issues. Tell people about the horrors of breeding mills. Everybody can make a difference once they take action! You might be truly surprised how many lives you can touch, by simply taking that first step. If you can make a difference for one parrot, isn’t that worth it? So the next time someone tells you how much they love your parrot and would like to have one….sit them down and tell them the truth about what life with a parrot truly means. We can’t wait for someone else to do this, we must take a stand and do something ourselves. We are their Voice! We are their only Hope!